Who’s that man covered in blood? It looks like he’ll be able to give us the most up-to-date news on the revolt, as he clearly was just wounded. This is the strong soldier who fought to keep me from being captured. Hello, brave friend! Tell the king what the status of the battle was when you left it. 'Gainst my captivity. Hail, brave friend. In this simile, the two exhausted armies of Scotland and Norway are compared to two tired swimmers, who are drowning each other by clinging to each other. In this metaphor, the peasant soldiers (kerns and gallowglasses) are swarming to join Macdonwald’s rebellion, like insects swarming from a nest. The outcome was uncertain. The opposing forces were like two exhausted swimmers who grab onto each other until they’re both drowning. The rebel leader Macdonald -- a man born with all the traits of a merciless villain -- had been joined by peasant soldiers from the Western Islands. And Fortune, the goddess of fate, has taken the rebels’ side. But they weren’t strong enough, because the brave Macbeth – for he certainly deserves that name – defied Fortune. Waving his sword, he cut a path through the rebel forces until he came face to face with Macdonald. Macbeth didn’t even bother to shake hands before he ripped Macdonald open from his navel to his jaw, and placed his head on our castle wall. Showed like a rebel's whore. But all's too weak. Fortune (goddess of fate) is taking Macdonald’s side in the quarrel (quarry). Fortune is smiling at the bodies of the royal soldiers slain by Macdonald (his quarry). Fortune is smiling at Macbeth, Macdonald’s intended victim (his quarry). O valiant cousin, worthy gentleman. Oh what a brave nobleman! What a worthy gentleman! Just as spring brings longer days, it also brings thunderstorms capable of sinking ships; that which seems to bring comfort, brings discomfort, too. Take note, King of Scotland. As soon as justice, armed with courage, sent the rebels into retreat, the King of Norway, thinking that he could take advantage of our exhausted state, attacked us with his fresh, well-armed forces. In this metaphor, the period after Macdonald’s defeat, when the King of Norway attacked, is compared to the springtime. Spring is comforting (like the rebel defeat), but it’s also a time when violent storms (like Norway’s attack) occur. This didn’t distress our captains, Macbeth and Banquo? It didn’t distress them any more than sparrows frighten eagles, or rabbits scare lions! But, in all seriousness, I have to tell you that they were like cannons loaded with double shot; they were twice as fierce in their attacks on the enemy. It was as if they wanted to bathe in their enemy’s blood, or make the battle as memorable as Golgotha. But, oh, I feel faint. My wounds need treatment! Your story speaks as highly of you as your wounds do. They both show us your honor. Get a doctor. My gashes cry for help. So well thy words become thee — as thy wounds. It’s the worthy Lord of Ross. He sure looks like he’s in a hurry! Anyone who looks like that must have something remarkable to report. Where have you come from, worthy lord? I’ve come from Fife, great King, where the Norwegian banners fill the sky and make our people cold with fear. In this use of wordplay, “point” could refer to a detail, as in, Macbeth matched the Norwegian king in every detail. But it could also refer to a sword point, as in, Macbeth confronted him with the point of his sword. 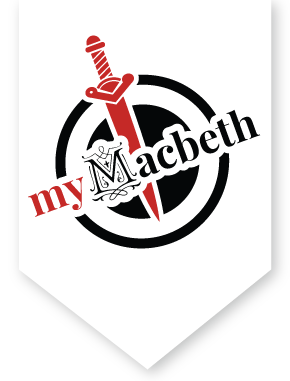 Macbeth matched his opponent in every manner, including his “rebellious arm.” The irony lies in the fact that soon enough, we will see that Macbeth will turn out to be just as much a rebel as Macdonald, Norway, and Cawdor. The King of Norway and his terrifyingly large army, assisted by the traitorous Thane of Cawdor, started a dreadful battle. But then Macbeth—as if he were worthy of marrying the goddess of war—put on his trusty armor and matched the King of Norway in every way. He broke his spirit, and so the victory went to us. So now, Sweno, the King of Norway, wants a truce. And we did not allow him to bury his men until he paid us ten thousand dollars at Saint Colme’s. the Norway's' king, craves composition. The Lord of Cawdor will no longer deceive me and abuse my trust. Give the order for his immediate execution, and give his title to Macbeth. I'll see that it’s done. What Cawdor has lost by his treason, noble Macbeth has won by his brave service.